Reading and share top 23 famous quotes and sayings about Directive by famous authors and people. Browse top 23 famous quotes and sayings about Directive by most favorite authors. 1. "If you've always known how to look at someone, it's strange when that directive changes" -Cassia, 'Matched"
2. "His (Claude Legrand's) method is founded in a simple directive: Don't conclude that the problem as it's first presented, or as you first perceive it, is indeed the actual problem. If you do, and you've got it wrong, the solution you produce may also be wrong. The first step to figuring out what your problem is, Legrand says, is to deconstruct it by questioning it." 3. "From the first extortion he had accepted, from the first directive he had obeyed, he had given them cause to believe that reality was a thing to be cheated, that one could demand the irrational and someone somehow would provide it." 4. "You're alive. Do something. The directive in life, the moral imperative was so uncomplicated. It could be expressed in single words, not complete sentences. It sounded like this: Look. Listen. Choose. Act." 5. "The motorization of law into mere decree was not yet the culmination of simplifications and accelerations. New accelerations were produced by market regulations and state control of the economy —with their numerous and transferable authorizations and subauthorizations to various offices, associations and commissions concerned with economic decisions. 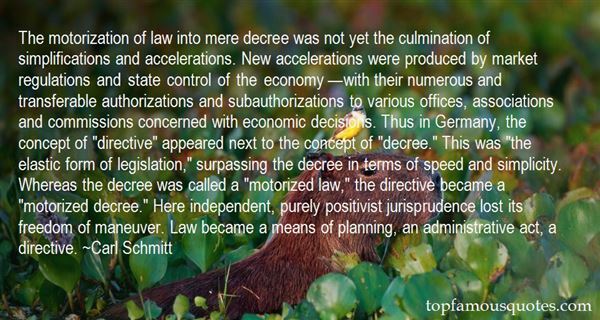 Thus in Germany, the concept of "directive" appeared next to the concept of "decree." This was "the elastic form of legislation," surpassing the decree in terms of speed and simplicity. Whereas the decree was called a "motorized law," the directive became a "motorized decree." Here independent, purely positivist jurisprudence lost its freedom of maneuver. Law became a means of planning, an administrative act, a directive." 6. "The European Parliament responded by focusing on corporate governance. If corporations wanted to be legal citizens they could damned well shoulder the responsibilities of good citizenship as well as the benefits. Social as well as financial audits were the order of the day. Directives outlining standards for corporate citizenship were drafted and a lucrative niche for a new generation of management consultants emerged - those who could look at an organization and sound a warning if its structure rewarded pathological behaviour." 7. "The term bellwether refers to the practice of placing a bell around the neck of a castrated ram (a wether) leading his flock of sheep. While out of sight, the sound of the bell is a directive on the whereabouts of the flock. When earning season begins, the bellwether stock is that of the largest (typically industrial) companies who report their earnings. Analysts look to these reports as an indication of how subsequent reports will come in under or over expectations." 8. "We sleep, allowing gravity to hold us, allowing Earth- our larger body- to recalibrate our neurons, composting the keen encounters of our waking hours (the tensions and terrors of our individual days), stirring them back, as dreams, into the sleeping substance of our muscles. We give ourselves over to the influence of the breathing earth. Sleep is the shadow of the earth as it seeps into our skin and spreads throughout our limbs, dissolving our individual will into the thousand and one selves that compose it- cells, tissues, and organs taking their prime directives now from gravity and the wind- as residual bits of sunlight, caught in the long tangle of nerves, wander the drifting landscape of our earth-borne bodies like deer moving across the forested valleys." 9. "I want completing the single market to be our driving mission. I want us to be at the forefront of transformative trade deals with the US, Japan and India as part of the drive towards global free trade. And I want us to be pushing to exempt Europe's smallest entrepreneurial companies from more EU directives." 10. 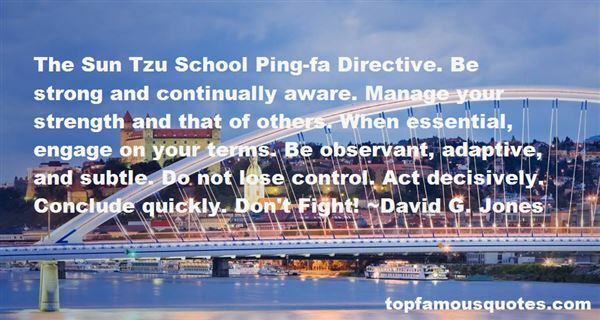 "The Sun Tzu School Ping-fa Directive. Be strong and continually aware. Manage your strength and that of others. When essential, engage on your terms. Be observant, adaptive, and subtle. Do not lose control. Act decisively. Conclude quickly. Don't Fight!" 11. "I do not espouse the unitarian position. President Clinton's assertion of directive authority over administration, more than President Reagan's assertion of a general supervisory authority, raises serious constitutional questions." 12. "Using the combined, integrated force of the mind and body is more efficient than using one without the other. Since the body can only exist in the present, that's where the mind should be too (unless we deliberately choose to contemplate the past or future). At the same time, the body needs to be healthy and in optimum operating condition so that it can respond effectively to the mind's directives." 13. "But you know the second month I was here I put out a healthy lifestyles directive. The pundits will say it was because we were sued. Well that's what they say. It was never about that." 14. "We don't want to merely obey God: we need to catch His heart. It is then we will glimpse the wisdom behind His directives, and not just see them as laws." 15. "And, consequently, the art of propaganda or public information becomes one of the most powerful forms of directive statesmanship." 16. 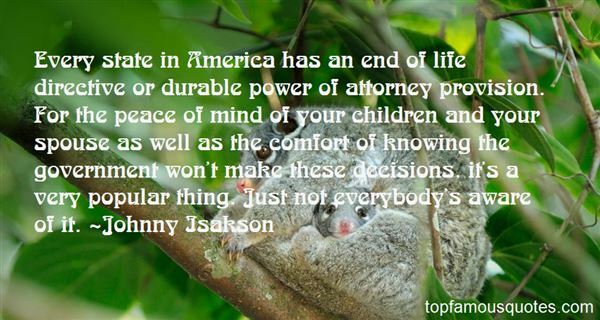 "Every state in America has an end of life directive or durable power of attorney provision. For the peace of mind of your children and your spouse as well as the comfort of knowing the government won't make these decisions, it's a very popular thing. Just not everybody's aware of it." 17. "If the prime directives were followed a little more accurately here on earth, I mean it sounds somewhat Pollyanna, but I think people would certainly get along better." 18. "Love, true love, love that denies itself and transfers itself to another, is the awakening within oneself of the highest universal principle of life. But it is only true love and affords all the happiness it can give when it is simply love, free from anything personal, from the smallest drop of personal bias towards its object. And such love can only be felt for one's enemy, for those who hate and offend. Thus, the injunction to love not those who love us, but those who hate us, is not an exaggeration, nor an indication of possible exclusions, but simply a directive for that opportunity and possibility of receiving the supreme bliss that love can give." 19. "On December 18, 1940, Hitler signed Directive Number 21, better known as Operation Barbarossa." 20. "The earth is the Lord's fullness thereof: this is no longer a hollow dictum of religion, but a directive for economic action toward human brotherhood." 21. "At bottom, you see, we are not Homo sapiens as all. Our core is madness. The prime directive is murder. What Darwin was too polite to say, my friends, is that we came to rule the earth not because we were the smartest, or even the meanest, but because we have always been the craziest, most murderous motherfuckers in the jungle. And that is what the Pulse exposed five days ago." 22. "I'm sure that if woman laid out the rules- requirements- early on, and let her intended know that he could either rise up to those requirements, or just move on. A directive like that signals to a man that you are not a plaything-someone to be used and discarded. It tells him that what you have- your benefits- are special, and that you need time to get to know him and his ways to decide if he DESERVES them. The man who is willing to put in the time and meet the requirments is the one you want to stick around, because tthat guy is making a conscious decision that he, too, has no interest in playing games and will do what it takes to not only stay on the job, but also get promoted and be the proud beneficiary of your benefits. And you, in the meantime, win the ultimate prize of maintaing your dignity and self-esteem, and earning the respect of the man who recognized that you were worth the wait." 23. "He is not a challenge, he is not a conquest. You were once that for him, back when he used to call you a little beast and defeated you handily, time and again. You got the feeling over time and then again that he didn't want to win, when he sparred with you. That was the motivation you needed. The opportunity presented itself; his weakness presented itself. You took it, you beat him, you got better, you stayed neck and neck. Just stay strong, was the first directive. Get stronger, was the next. Don't die, was the final, and that is where you remain. Daunting, to excel at a game that you must eventually lose. Unless you really are an angel. Unless he really is already a ghost." A miscarriage is a natural and common event. All told, probably more women have lost a child from this world than haven't. Most don't mention it, and they go on from day to day as if it hadn't happened, so people imagine a woman in this situation never really knew or loved what she had.But ask her sometime: how old would your child be now? And she'll know."